When you think of your spine, do you think of a straight row of bones that go from the bottom of your brain to the bottom of your back? In reality, the spine is made up of four different curves that provide balance and flexibility to your body and help prevent injury. These curves also allow the spine to support 10 times more weight than it could if the curves were missing! You can more easily see these curves when you view a model of the spine from a side view. Cervical Lordosis – A backward “C”-shaped curve located in the upper part of the spine. This curve helps to keep your head from moving too far forward. Neck pain usually results when there is any type of significant loss to this curve. Lumbar Lordosis – The five vertebrae of the lower back that are also in the shape of a backward “C.” This are of the spine faces backward when seen from a side view. Sacral Kyphosis – The sacrum is a triangular-shaped bone at the base of the spine, between both hip bones. It is also a “C”-shaped curve. As a fetus develops, it has only one type of spinal curve, the kyphotic “C”- shaped curve. As an infant’s motor skills begin to develop, the baby learns to hold its head up, sit, crawl, stand up and walk – all causing significant muscle development and allowing more weight to be shifted to the spine. This also begins the development of the additional spinal curves. It is important that these curves be properly maintained to balance your body and to avoid pain and injury. Motor vehicle accidents, slips, trips and falls are only the most obvious factors which affect our spines. Poor posture, excess weight, chemical and emotional factors also play significant roles in the loss of proper spinal curves… the results of which can be very damaging to your health. Of course, regular chiropractic check ups and adjustments help to maintain your proper spinal curves. 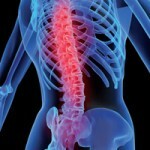 In addition, there are specific products, such as water-based cervical pillows, and orthotics that also help to keep spinal curves in place and your body in balance. We offer the highest quality of water-based therapeutic pillows here at our office. Many of you may have seen them on their Chiroflow stands within our office. As always, the purpose of these articles are to help you live a healthier more abundant life. All information shared in these articles is intended to help you do that. My hope is that that they are in fact helping you do that! !